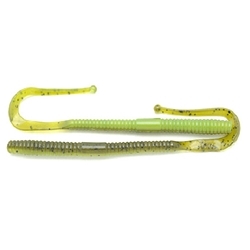 SOFT PLASTICS → Worms → Xcite Raptor Tail 7"
The Xcite Baits Raptor Tail™ Worm features high floating capabilities, and a unique ribbon tail action. A small vibration ball on the end of the ribbon tail accentuates the worm's tail movement, working bass into a frenzy, and its super soft ribbed texture causes bass to bite down and hold on. Also loaded with Xcite attractant to call in fish from greater distances. Comes 10 to a bag.